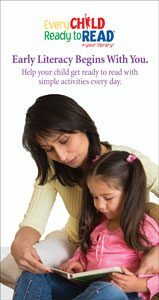 * Fun with Words for Parents and Children Workshop. 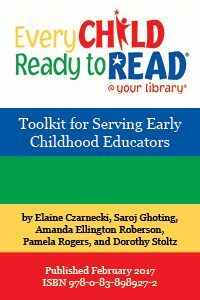 The kit also includes seven activity handouts, several booklist handouts, and lots of information and resources for providing the best early literacy programming for your Spanish-speaking community. 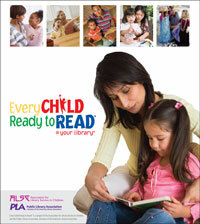 These colorful brochures are handy take-home items that explain the five simple early literacy practices (talking, singing, reading, writing, and playing) and include practical ideas and activities to help parents/caregivers get their children ready to read. Brochures are sold in packs of 100. 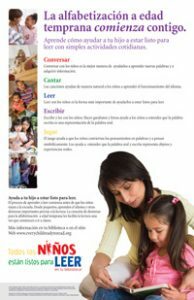 This colorful Spanish-language brochure is a handy take-home item that explains the five simple early literacy practices (talking, singing, reading, writing, and playing) and includes practical ideas and activities to help parents/caregivers get their children ready to read. Display this engaging poster at your library to promote ECRR workshops and remind parents/caregivers of the five simple early literacy practices: Talking; Singing; Reading; Writing; and Playing. Poster measures 22″ x 34″. 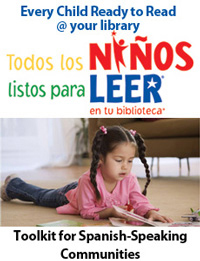 Display this engaging Spanish-language poster at your library to promote ECRR workshops and remind parents/caregivers of the five simple early literacy practices: talking, singing, reading, writing, and playing.